Have you seen real estate ads containing the letters OWC? It stands for Owner Will Carry and it is a growing way for sellers, buyers, and investors to finance real estate without traditional bank loans. 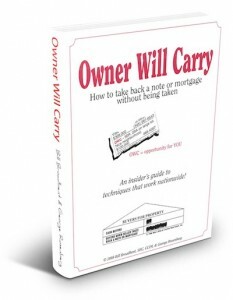 Owner Will Carry – How to take back a note or mortgage without being taken! Written by Bill Broadbent, SEC, CCIM and George Rosenberg this is an insider’s guide to to owner financing techniques that work nationwide. Backed by 80+ years of combined real estate experience, it shows the proper structure of a note so that it is safer when held for income. These same strategies are also used to demand the highest possible price if the seller carry back payments are sold for cash in the future. Can You Benefit From The Owner Will Carry Financing Book? Are you trying to sell your real estate without the help of an agent? Adding three magic words to your ads can double your pool of buyers. Are you a Real Estate agent whose listings are not selling? If you use these concepts you should close one or two extra deals per year. Use this information to benefit and protect your client and make more sales. Are you a home buyer or investor who does not fit the institutional loan qualifications to buy Real Estate? You are not alone! In many areas over half of all potential buyers don’t qualify for a bank loan. Do you want to sell or buy land or a property in an inner city or anywhere that is ignored by financial institutions for any reason? How to get financing when bank say NO! Are you a developer or contractor who has a property for sale? Are you involved in a divorce or other partnership dissolution that involves real estate? Do you lend of invest in notes secured by trust deeds or mortgages? Do you buy, sell or broker notes? Are you an attorney who does not specialize in Real Estate? Has a friend or relative asked you to lend them money secured by Real Estate or asked you to co-sign a loan? This book will either make you a lot of money or may save you a lot of grief. Grab you copy in PDF format and start reading today!